In 2013, the Ramen Burger crazy swept over America by Keizo Shimamoto and it was one of those "Why didn't I think of that..." creations. Immediately there were hundreds of recipes for the Ramen Burger and none of them felt right in my mind. I was able to try the Official Ramen Burger at a San Francisco Tofu Festival last year, and I have to admit, it was pretty damn good. I have never attempted making a Ramen Burger as I was always more interested in making the conventional soup and noodle ramen, but seeing bloggers and imitators making mediocre Ramen Burgers, I decided to see how I could fare. In the words of Sir Mix-a-Lot, My Mouth don't want none, unless you got buns, hun. The ramen bun is what makes the burger what it is. It has to (1) hold its shape, and (2) have the texture of ramen noodles. To do this right, you need to know the Ramen Burger does not contain eggs. Almost all recipes include egg, which is understandable as the egg act as a binder and satisfies condition (1). However, where the inclusion of the egg fails is in its texture. As the egg cooks it crisps up nicely on the outside (which is a plus), but on the inside it solidifies into a custardy quiche like egg. Some actually resemble tamago. In its own right, a custardy texture is nice, but it clashes with the chewy al dente tooth feel you get with fresh ramen noodles. This was originally all speculation, but I decided run some tests because if you never try, you will never know. The first things you need to start with are good quality noodles. I choose Sun Noodles as they are practically their American Standard for authentic ramen noodles. They make over 90,000 servings of noodles a day for restaurants all over the country, and most importantly they are the source for Keizo's Ramen Burger. I created 3 batches of noodles: (1) uncooked, (2) blanched (cooked for 10 seconds), and (3) fully cooked. I tested the uncooked brushed with eggs, and the blanched and fully cooked noodles with and without eggs. (1) Uncooked with Egg: This was one of my least favorite. For uncooked ramen noodles, you have you use egg to act as a binder, otherwise you end up with ramen chips. It had a raw doughy flavor. The egg was good, but just not what you want for a ramen burger. (2) Blanched Noodles w/out Egg: This was one of my favorite, and very close to the Original Ramen Burger. By blanching the noodles, you start to gelatinize the starches and cook out the raw flour flavors. These noodles were taken out a little too soon. 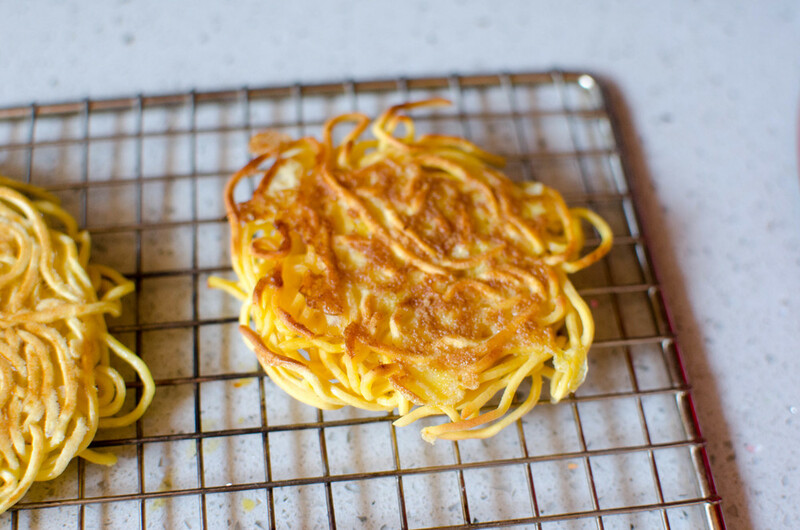 (3) Blanched Noodle with Egg: The egg in this version gave the bun a cake like texture which was very interesting, but not what I was looking for. (4) Fully Cooked Noodles w/out Egg: This noodle bun tied for first. The noodles ended up overcooking in the pan and was a little on the mushy side. If I took out the noodles a little earlier it would have been perfect. (5) Fully Cooked Noodles with Egg: The final trial wasn't that satisfying. The semi-mushy noodles and egg combo was a little off putting. It felt a little dense. The outside was crispy, but it was difficult to cook out the moisture out of the mushy interior. The Conclusion: To get the best buns, you have to par cook your noodles for 30 seconds. Make sure you don't rinse off your noodles, or you will rinse of the starch the will bind your noodles. It is important to compress your noodles as soon as you can by sandwiching the noodles in between two soup/quart containers. After you let them cool for a bit before finally cooking them in a pan. After performing this experiment, I finally found a video of Keizo on Conan explaining how they make their noodle buns confirming what I concluded. I am not sure what steps go into their secret patented process, but I am pretty sure its not far off from just compressing their noodles. With a few more experiment, I think I will have this down. Now that we figured out the noodle component of our ramen, we have to create the soup component. The Original Ramen Burger uses a Shoyu Tare combined with caramelized onions. For those of you who are new to making ramen from scratch, the tare is the salt/flavor component of the broth. Boiled bones and veggies alone is very bland and can be very off putting. The salt in the tare brings out the true flavors of the broth as salt is a flavor enhancer. If you get a ramen kit from Sun Noodle you're half way there to making your sauce. The soup base packet is essentially a concentrated tare. You just need to slowly caramelize your onion to the point it is like a jam then add your tare at the last moment. You're left with a spread filled with umami. 1. Dice a medium onion and place into a pan with oil on medium low heat. You want to cook these for about 30-40 mins while stirring often. If the heat is too high the onions will dry out or burn. If they begin to stick to the pan, add a little bit of water and stir. 2. Bring a large pot of water up to a boil and cook noodles for 30 seconds. 3. Divide noodles into 6 and place the noodles between two soup containers. I used quart containers. Don't be afraid to press down, you want to make sure that they stick together. Place the noodle patty in plastic wrap and place in fridge to set. 4. While the noodles are cooling and the onions are caramelizing, divide your ground beef into quarter pound patties. Salt and pepper both side and flatten so that is larger than your ramen noodle bun since your patties will shrink. 5. When your onions are all brown and begin to have a jam like consistancy, add half of the soup base for 1 serving of ramen from your ramen kit and take off the heat. 6. Cook your burger patties to your preferred doneness. 2-4 minutes per side depending on the thickness of your meat. 7. On a pan on medium heat, add sesame oil and cook your ramen noodle buns until they are brown on both side. 2-3 minutes per side. 8. Finely dice your green onions as a garnish. 9. Assemble your burger. Spread the Ramen Tare Caramelized onions on your bun, place your lettuce and your burger patty on top, garnish with green onions, and place the bun top on and enjoy.